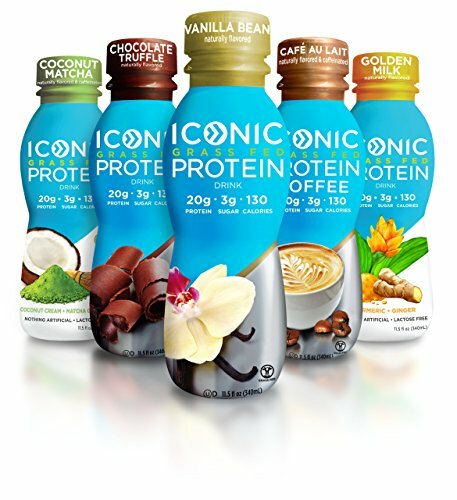 ICONIC Protein is a line of ready-to-drink protein drinks made with premium New Zealand-sourced grass-fed milk protein. Iconic is a tasty and healthy snack or light meal replacement for busy professionals on the run, moms on the go, and anyone in need of a natural and filling low calorie pick-me-up. Our 20 grams of grass-fed protein are perfect for workout recovery and an ideal source of clean energy for an active lifestyle. Each bottle of ICONIC Protein contains 20 grams of protein and 4 grams of fiber with 3 grams of natural sugar and 130 calories. ICONIC Protein is free from lactose, GMOs, gluten, soy and carrageenan, and has been tested hormone- and antibiotic-free by a third-party lab. Chocolate Truffle: Creamy and indulgent. Made with ethically-sourced cocoa powder. Café Au Lait: Made with real Colombian coffee. 180mg of caffeine in each bottle, equivalent to two cups of coffee. Vanilla Bean: Smooth, sweet taste. Light and refreshing hydration. Coconut Matcha: Contains a serving of matcha in each bottle. 80mg of caffeine in each bottle - equivalent to a cup of coffee. Coconut cream balances the naturally bitter flavor of matcha. TRY ALL 5 FLAVORS BEFORE COMMITTING TO A 12-PACK: Sample every delicious flavor of ICONIC with our 100% satisfaction guarantee: Chocolate Truffle, Cafe Latte, Vanilla Bean, Turmeric Ginger, and Coconut Matcha. Yum! DELICIOUS ON-THE-GO SNACK OR MEAL REPLACEMENT: each ready to drink bottle includes a full 20 gram serving of protein, 4 grams of fiber, and only 3 grams of sugar and 130 calories. Paleo, Keto, and diet-friendly, Iconic is the perfect snack, breakfast, or light meal replacement shake for those on the go, or on low-carb and weight loss diets. Only 2 Weight Watchers Points per bottle! HIGH QUALITY, NATURAL GRASS FED PROTEIN: each bottle boasts 20 grams of premium protein from truly Grass Fed cows. If you have any questions about this product by ICONIC, contact us by completing and submitting the form below. If you are looking for a specif part number, please include it with your message.